When shopping for kitchen faucets, there are so many brands and models to choose from. 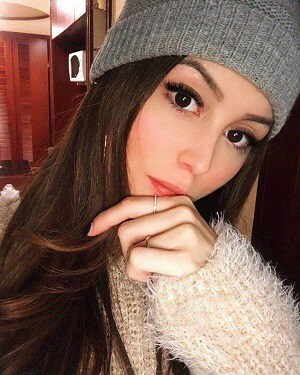 All of them have their specific peculiarities, advantages, and downsides. To help you with choosing the right faucet, we have compiled reviews of some of the best kitchen faucets. This article also includes a buyer’s guide. It will also cover some frequently asked questions many buyers have about buying kitchen faucets. 4.1 How important is a decorative plate in my kitchen faucet installation? 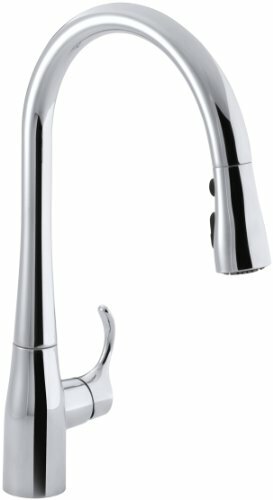 4.2 How do I choose the right faucet for a very busy kitchen without compromising pressure and water flow? 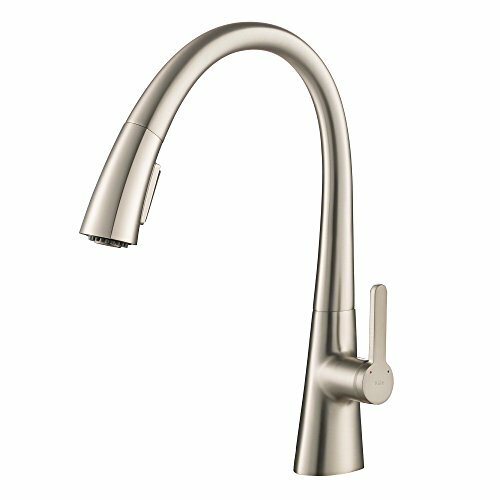 4.3 Is the finish of my faucet an important factor to consider? 4.4 How important is a disc cartridge; can I go for a cheaper faucet that doesn't have a disc cartridge? This faucet is suitable for both modern and contemporary kitchen settings. Its simple yet stylishly designed kitchen faucet makes a lovely addition to your kitchen. Despite not being a pullout faucet, the VAPSINT 360 Degree Swivel Kitchen Faucet is one of the top rated kitchen faucets for a good number of reasons. You will most likely enjoy using this kitchen faucet for a very long time to come. First, the mere fact that it isn’t a pullout design might help to prolong its life. And you need not to bother about its reach as it still gets you a reach of up to 7.5". In addition to this, you can be assured of long term perfect operation thanks to its ceramic disk valve. This reduces he probability of the unit dripping as it ages. Finally, that this faucet has a sturdy brass construction and its brushed nickel finish is another pointer to long-lasting use. This faucet is also quite easy to install. It is designed to fit perfectly into both old styled 1/2" hoses as well as the more modern 3/8". It comes with one hole installation and comes with a single handle that gives you seamless control over your water temperature. 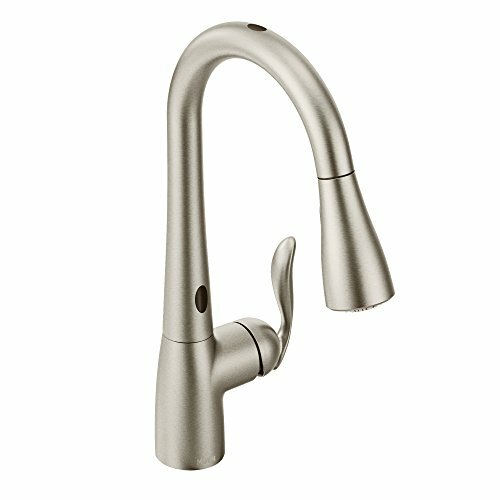 Designed to be smart enough to predict your moves, Moen Arbor Touchless Kitchen Faucet makes washing super easy. By all standards, this is one of the best-rated kitchen faucets you will simply be glad you installed. It comes with two motion sensors which make it possible to operate the faucet by simply moving your hands. This faucet is designed to perfectly fit into any type of the kitchen. Also, it adds a touch of elegance to your countertop. On top of that, you also get added functionality as well. Thanks to Powerclean spray technology, you get spray power that is as much as 50% higher than a regular faucet. Additionally, this faucet has a flexible design which makes both single and 3 hole installations possible. It also features a special Duralock connect technology which makes installation supers simple. More than just a pullout faucet, the Moen Arbor features a retractable reflex system. This automatically retracts smoothly and makes secure docking of the spray head possible. In all. 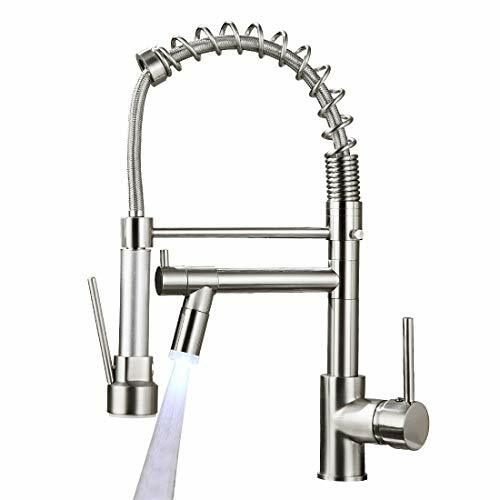 this piece is one of the good kitchen faucets and perhaps the smartest for your kitchen. With 3 functional spray settings, multi-tasking with this faucet is piecemeal. You can use the stream mode for filling water. The high-pressure spray mode is suitable for rinsing while the pause mode allows you to control your water seamlessly. The best part is that all of these are controlled with a single button. Temperature is also controlled by a single button as well. This sleekly designed kitchen faucet is made to match most sink types. This is why it is well perceived by most users and one of the top rated kitchen faucets out there. If there is something else that pushes it ahead as one of the great kitchen faucets is how easy it is to install this unit. You can get it installed all by yourself. And you can trust the ease of operation as well. Its 360-degree swivel spout ensures that you get full reach without compromising space. This practically designed faucet has an effective retraction system which helps to pull back the sprayer head once it is released. You can also be sure of its durability as it comes with a corrosion resistant finish which also makes it easy to maintain. The Rainer Pull-Down Kitchen Faucet features a retro-gooseneck design. It has a high swivel spout which provides greater reach and sufficient workspace in your sink. Its sturdy, heavy duty stainless steel design of hoses and compression connectors guarantees long term usage. Like other top rated kitchen faucets, you don’t have to worry about corrosion or tarnishing. The presence of a ceramic disc valve also ensures smooth long term operation with reduced probability of dripping as it ages. You will be impressed by the ergonomics of this Faucet’s design. It features a single lever operation for controlling both temperature and water pressure. Although it typically has an extensible spout, it comes with a lock bar which helps to keep the spout in place when it is not in use. Comfort is one of the main highlights of this faucet. It is absolutely designed for the comfort of the user while in use. It all begins right from the process of installation, as it allows you to choose to install the unit seamlessly with a flushed-fitted deck plate base all by yourself. The Kraus KPFis a pull-down kitchen faucet that definitely qualifies as one of the best on the market. Not only does it sport an 18 inches retractable hose, but it also comes with Swivel adapter which makes it possible to manipulate the faucet to reach every part of your sink. In addition to this, magnetic docking technology helps to hold the spray head securely in place once you are done using it. With this faucet, you don’t ever have to worry about fitting in. In terms of appearance, all of its different finishes (chrome, stainless steel or matte black) are optimized to fit in well with any type of sink. Also, the spot height has been optimized to fit in underneath your kitchen cabinet while providing enough workspace in the sink. If you are looking for a kitchen faucets that are not only sleek but also elegant, then this faucet is for you. 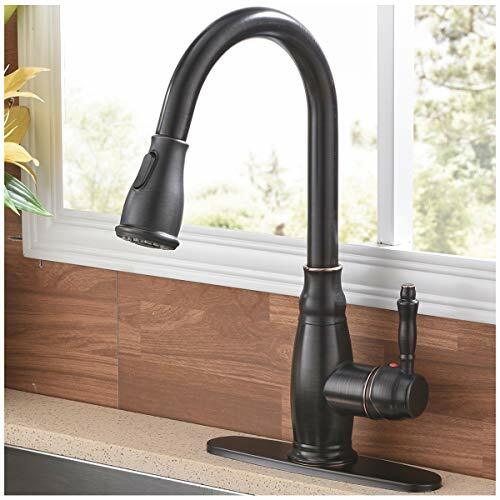 Featuring a unique high arc design and a matte black finish, this faucet is designed to fit in perfectly in all kitchen types. 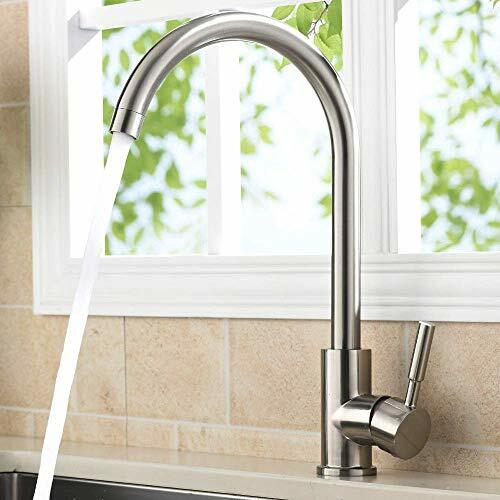 The AguaStella AS98MB comes with 3 spray options which make washing convenient for users, this pull-down faucet also gives you complete reach of your sink thanks to its 20-inch retractable hose. Furthermore, it comes with special features Neopearl Aerator which helps the faucet to deliver an aerated stream of water. It also comes with anti-twist protected motion and connecting hoses and SPX online. Thus, you have a guarantee of healthy and hygienic drinking water from this faucet. All the hoses in this faucet come reinstalled. Consequently, you can be done by installing the unit in just a few minutes all by yourself. With such a sturdy construction complemented by its elegant finish, you can be sure of long term usage without corrosion which is a top featured mentioned in this kitchen faucet reviews. Kohler has always been known for making some of the better kitchen faucets around. This particular model is just another testimony of that fact. Typically, you get excellent build quality with this faucet. On top of that a corrosion resistant finish which guarantees long term use. This pull-down faucet features an extensible hose which not only gives you greater control but an even greater reach. With this faucet, you can easily choose between 3 spray functions with a single button. You get the typical stream and spray and an additional boost mode which allows you to increase the flow rate by as much as 30%. Installation is easy and can be completed in just a few minutes even without the help of an expert. The spray head and hose come pre-installed which makes installation simple for both single and 3 hole settings. Likewise, you will also find the operation of this faucet just as convenient. The spray head is easy and comfortable to use thanks to its light hose and its swivel ball joint. Its MasterClean Sprayface technology also makes maintenance easy as it prevents mineral buildup that causes damages. In all, going by this kitchen faucet reviews out there, this is by far one of the best options to choose. If a combination of brass construction and an Oil Rubbed Bronze finish doesn’t impress you, it's doubtful if anything else will. With such a design on this antique styled Kitchen faucet, you can be almost sure of its durability and reliability. This faucet features a retractable 20 inches hose. Also, it has a spout and nozzle which can rotate 360 degrees. With features like this, it rivals the very good kitchen faucets out there in terms of reach and convenience of use. Additionally, a weight on the sprayer also helps to keep the hose in place when not extended. Moreover, installing this faucet is just as simple too. It comes with features such as a quick connector, a mounting thread, and an L-wrench all of which makes installing the unit quite easy even for a non-expert. There is also a deck plate and an optional escutcheon. This faucet is suitable for both single hole and 3 holes installations. 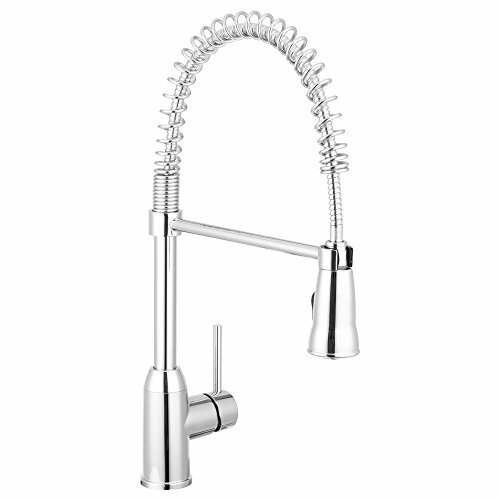 Apart from its improved flexibility, and sleek look one of the many advantages of Commercial-Styled Spring Design kitchen faucet is how it adds a uniquely modern look to your kitchen. But that’s not the only things to like about this faucet which qualifies as one of the top rated kitchen faucets for the money. It features a solid build made of brass and a single lever design both of which consequently contributes to its durability. In addition to long-lasting performance, this faucet is ergonomic too. It comes with a single handle. Also, it has a swivel neck which can rotate 360 degrees. Also, it is designed to deliver water with a stream and spray mode without splashing or wasting water. A perfect combination of modern functionality with traditional style, this faucet is a timeless and practical addition to your Kitchen. It comes in Four Finishes typical of the kitchen faucets around. This includes the chrome, Venetian Bronze, Arctic Stainless and SpotShield Stainless finish. All of these are durable and match the style of your kitchen perfectly. Another major feature you will like about this faucet is how easy it is to install. It features Duramount mounting technology which is notable for how it effectively eliminates the possibility of leaks. A single piece supply line makes it quite easy to install. On top of this, the diamond seal valve also helps to keep the setup stable with a little propensity of leaks occurring as the faucet ages. Additionally, you will find other desirable features on his faucet as well. Touch-clean technology helps to prevent mineral build up. Magnetite docking helps to keep the spray head in place when not in use. And you get two flow modes ergonomically controlled by a single button. Faucets come in varying shapes and styles. Picking the right kitchen faucets begins from getting yourself familiar with the various options available and knowing the pros and cons for each type. For example, although a gooseneck model will generally have a higher clearance, it is not recommended if your sink is shallow. Which brings us to the next point. The style, shape and eventual type of kitchen faucet you purchase must be one that fits into your current kitchen configurations. In terms of style, it should fit in and complement the features on your countertop. You must also consider how much space you have, the size of your sink, size of existing hoses among other factors. The good kitchen faucets are usually quite durable. Most of the times, the durability of your faucet is dependent on the build materials as well as the finishing. You should always choose a faucet that is resistant to corrosion and tarnishes as this has the potential to last longer. Moreover, the finish also contributes to the appearance of your faucet how well it fits into your kitchen. From this kitchen faucet reviews, you should be able to pick models that are easy to install. The most versatile models are compatible with multiple hole installations. Unless you are willing to hire a professional, consider faucets you can easily install by yourself. These are few of the factors to look out for when shopping for kitchen faucets. From all indications, it isn’t enough that your choice is among the top rated faucets, it must also fit in well with your kitchen features among other important factors. When shopping for kitchen faucets here are some popular questions that come up and helpful answers for them. How important is a decorative plate in my kitchen faucet installation? As you might have noticed, a decorative plate is not necessarily an important component of your faucet. Which means it could be being removed and not have any direct effect on the operation of the faucet. The purpose of a decorative plate is nothing more than aesthetics. This means you can choose to leave it out if you don’t think it improves the appearance of your faucet the way you want it to. 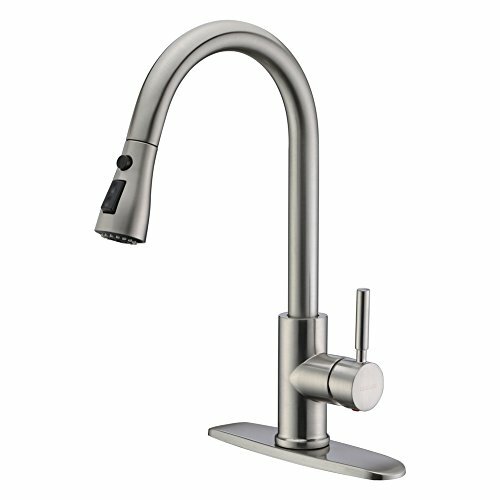 How do I choose the right faucet for a very busy kitchen without compromising pressure and water flow? For a busy kitchen, you obviously need more water than usual. Also, you need your faucet to be adaptable and versatile. Of all the types of faucets available, the one that best fits that description is a pullout faucet. They are more adaptable allowing you to maneuver your way through all of your many activities more conveniently. Thus a good quality pullout faucet is recommended. 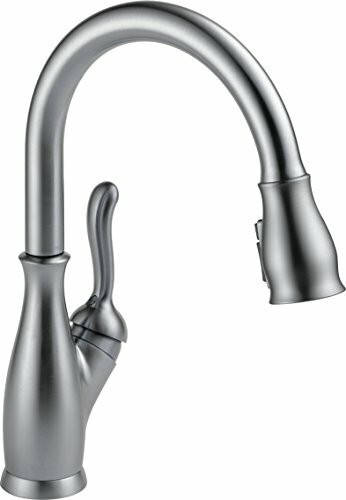 Look through this kitchen faucet reviews to find top quality pull out faucets. Is the finish of my faucet an important factor to consider? The finish of your faucet is an important factor to consider when picking a kitchen faucet for your home. There are various options available which make picking one even harder. The finish determines how resistant the faucet will be to corrosion. You also want to watch the finish and ensure that it isn't one that will contaminate your water. Additionally, the finish of your faucet will also determine how easy it will be to maintain it. The kitchen faucet is resistant to tarnishes and are easier to clean without peeling off the coating. How important is a disc cartridge; can I go for a cheaper faucet that doesn't have a disc cartridge? Although faucets with disc cartridges tend to cost a little bit more than regular ones, you should still go for one with a disc cartridge. You should know by reading this kitchen faucet reviews that faucets with disc cartridges are more durable. They are less prone to leakages and will most definitely last longer than the ones without. So despite the extra cost, It is still a valuable investment in the long run. Choosing the kitchen faucets depends on a combination of factors. We have tried to cover some of the important things to consider. You can also check from the list of options we have provided. While this isn't an exhaustive list, these are some of the best models and top-rated kitchen faucets you can find. Of course, if you need further clarifications of choosing the right kitchen faucet, speaking to your plumber isn't a terrible idea.